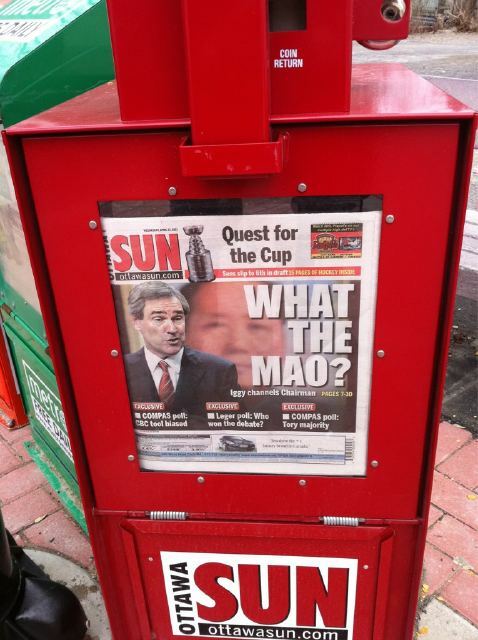 Sun Media is the object of considerable ridicule and derision today over a front-page story alleging that Liberal leader Michael Ignatieff was “channeling” Mao Tse-Tung in the Tuesday night leaders debate. “Let some flowers bloom here, let democracy breathe. Let it live,” Ignatieff implored Conservative leader Stephen Harper in one exchange during the debate. From there, it was an easy leap to tie Ignatieff to “the most prolific mass murderer in the history of mankind” and the deaths of millions of Chinese — the Sun uses the disputed figure of 65 million. The Sun also takes at face value the claim that the Hundred Flowers Campaign was a ruse to draw out Mao’s enemies, who were later imprisoned or executed. That’s a contentious and newer interpretation. Others believe Mao’s spirit of glasnost was legit but he didn’t anticipate the degree of discontent it would reveal, so he changed course. That the enemy flowers had sprung up was a happy accident. Again, probably only of interest to Sinologists. The absurdity of the comparison to the Great Helmsman is that Ignatieff’s ancestors were chased out of Russia by the Communists and, with their Tsarist connections, almost certainly would have been executed had they hung around much longer. We’ve run three serious experiments in the twentieth century to create communities that would replace narrow capitalist selfishness with communitarian fervour — experiments by Hitler, Stalin, Mao — and the results are definitive. Now, he doesn’t elaborate on which way he believes the results are definitive, but I don’t think there’s much doubt. The Sun’s coverage of the election so far has been absurd. This story just adds to the absurdity. The fact that they can take a small quote from Ignatieff, butcher it to suit their obvious bias, compare it to a historical figure who is completely irrelevant to the event reported on (namely, the debate), and then run it as their front-page story makes me wonder whatever happened to journalistic integrity. This sort of thing makes yellow journalism look downright appealing. Now you see how the CBC treats the Conservatives. I just wanted to share a couple links from the Liberal website I thought were relevant. Crap. I think I got conspiracy theories mixed up. Far too funny! Yet sadly, an incredibly accurate mockery…. One of these quotes is by Stephen Harper from last night, and one is from the Constitution of Cuba. Ergo, Stephen Harper is channeling Casto? When harper refers to public health insurance he is not talking about universal public health care. He believes in using private health care or as he stated in the debate in English “alternate” health care. He couldn’t understand why he was being questioned on this statement. He is a sly one. Using words that sound similar to other words that mean something different. I didn’t know you were a Maoist. That explains a lot. That’s Kory Teneycke’s stupidity for you, right there, from his brain, up Lilley’s arse to his keyboard. That’s how Sun stories get written. Amazing that Quebecor lets it continue, wonder why. Why? Simple. Whereas well articulated thoughts are based on sound principles and clear vision, stupidity on the other hand knows no boundaries. Ah yes, whenthings don’t go their way, Liberals stoop to name calling. The symptoms were all there: tunnel vision, lack of affect, lifeless eyes, monotonous voice. Sounds like beta blockers to me. If a kid had turned up in one of my classes in the state Stephen Harper was in last night, alarms would have gone off. I wonder what shape he’ll be in tomorrow night. Acc. to a “senior Tory,” maybe even Hugh Segal, Harper learned how to govern by reading up on Joseph Stalin. Actually…the references to Mao started last night on twitter in both the NP and CBC tweets…one by a NP journalist and the others I didnt know who they were. I guess they were just as confused with the flowers blooming quote as everyone else. It wasn’t Conservatives who brought this up it was students who were tweeting the debate. So are we supposed to believe that a Harvard professor of History and Politics doesn’t get the reference he was making? “Let the flowers bloom” sure does sound like “Let a 100 flowers bloom.” It’s a very famous part of Maoist doctrine. Ignatieff was lecuring Canadians on democracy using Mao. Given the Liberal war rooms desire to portray Harper as Robert Mugabe, I guess they figured Chiang Kai Shek would do. It’s an old reference, but Ignatieff is old. He had to know what he was referencing. Maybe born Canadians don’t get the reference, but I’m not sure that Vancouver’s large Chinese-Canadian community will appreciate it too much. And I don’t think they will mistake that sentence for anything else. So has Iggy and the Liberal War Room given up on Chinese Vancouver to try to win the old Maoist vote (aka NDP vote) in Quebec? We’ll see if he uses it again tonight. I assume you’re kidding, and don’t actually think a (as you point out) Harvard professor of History and Politics would use a Mao quote as inspiration? He used a phrase that is somewhat like another phrase. Should we never utter phrases uttered by murderers? Again, I assume you’re kidding, and not just a nutjob. The Harvard professor of Politial History is unfamiliar with this??????? Yeah not for a second do I believe Ignatieff didn’t reference that deliberately. So you are a nutjob. My bad. The important part being the ensuing crushing of dissent, made easy by all those people who just outed themselves. a point that’s utterly lost on you lot, who are so eager to use a guilt-by-association slur to crush the Opposition Leader who’s point, ironically, was to decry the way the leader of the gov’t has crushed dissent by expelling people from his rallies and withholding funding from advocacy groups…. i.e., by stomping on the flowers. So Iggy sounds like Mao by accident, rather by design? That’s an interesting defense. The corrupt Liberal media can dish it out, but they sure can’t take it. Look for the name calling to begin from the coalition supporters. Whether Ignatieff was attempting to (mis)quote Mao or not his message was clear. Let the people speak!!!! We aren’t all going to agree on everything ,but you ,as a Canadian citizen are entitled to question your Government. The members of the House work for us! We are not wanting to have a Dictator like Mao tell us what to do. Something Harper should keep in mind as he goes on complaining about other people who have different ideas than he does. We want checks and balances in our Parliament! Obviously there is only one logical reason that Ignatieff would worm those words into his speech. He’s sending a signal to Coalition supporters that they should begin making lists of opponents so that they can be rounded up and sent to collective farms in Nunavut after the Coalition comes second in the election but seizes power anyway. It’s so simple now. I’m so glad we have Sun! Oh, and yes, this post was intended satirically. Just in case there’s any confusion. I guess Mao had Wordsworthian leanings. How many times have we seen raw talent ‘bloom’or ‘blossom’? Their comparison was a stretch. Sun Media – rubber banding the truth and snapping opposing views.